Jenn Bruyer is coming to EA on Sunday, November 11!! 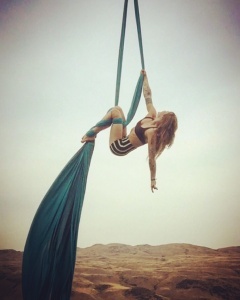 Jenn Bruyer has been immersed in aerial arts since 2008. She is driven by her focus on silks and sling (hammock) but also enjoys exploring cord lisse, trapeze, lyra, net and rope & harness. She has coached, choreographed and performed across the US from New York to Alaska. And has recently resettled in Seattle, WA after completing a 5 month 25 city workshop tour. As an Aerial Coach, she seeks to provide the highest quality progressive instruction to aerialists of all abilities from novice to professional performer. Her mission as a human is to cultivate a warm, non-judgmental learning environment that fosters community, to build personal physical and emotional strength within the individuals who participate in this environment and methodically construct a vehicle by which to create art. We are so incredibly stoked to have Jenn (aka HeelHang) out to EA! She’ll be teaching three workshops with us. Two 90 minute workshops for our intermediate/advanced silk students and one 2 hour all levels sling workshop! Grab them while you can, spots are very limited! !